Android devices now make up the lion’s share of smartphones and tablets most consumers use these days. In fact, as of 2017, the Android operating system accounted for over 85 percent of all mobile devices. With popularity comes risk, however, and Android devices are far more prone to getting viruses than their Apple iOS counterparts. This is not to say Android devices are inherently worse than Apple’s iOS devices such as the iPhone or iPad. What it means is that, as with Windows computers, you should take a few extra precautions to protect your Android devices with a solid antivirus app. And if you’re already dealing with what you think may be a virus on your Android device, you will want to clean your phone or tablet of malware as soon as possible to prevent any potential data or privacy losses. 5 Do I really need an Android antivirus? Before diving into free and paid versions of Android antivirus apps, there’s one option you might want to consider: multi-device antivirus applications. Many software security companies offer an antivirus subscription that covers every device you have—including your laptops, desktops, smartphones, and tablets. In most cases, highly-rated and trustworthy AV software companies offer stand-alone Android apps in the Google Play Store with both free and paid versions. However, you might be better off purchasing a subscription from a company that covers all of your devices instead of just your Android. And given the all-in-one subscription typically provides access to the Android app as part of the package, you might find more value in this route if you already intended to purchase a quality Android antivirus app. Panda Security offers a consumer-friendly antivirus tool called Panda Dome designed to protect all of your devices. As such, Panda Dome provides an Android application alongside its Windows application for the price of the subscription. Read our Panda Dome 2018 review for more information. Bitdefender is among the best antivirus providers in the market. When we reviewed their Antivirus Plus 2018 software for Windows, we found it to be extremely well crafted. Their virus scanning tool is extremely effective, and it features one of the most aggressive (in a good way) real-time protection tools we’ve tested. The service allows you to not only protect your Android mobile devices with a mobile version of its software, but you can also manage your other Bitdefender Antivirus installations from the mobile app. Read our Bitdefender Antivirus Plus 2018 review to learn more. We gave Vipre Antivirus some favorable reviews after conducting an extensive test of the software. The only major concern with this software company is its comparatively poor customer service. Beyond that, the company offers protection for both your computers and Android devices rolled into the same subscription. VIPRE’s Android app has not been widely downloaded on the Google Play Store, primarily because VIPRE itself is a lesser-known company. However, their AV tool is one that’s worth checking out. Our VIPRE Antivirus review has more details on what they offer. McAfee and its antivirus tools are well known and commonly used by both businesses and consumers alike. In some cases, you’ll find McAfee’s antivirus tool comes pre-installed with a new Windows PC or laptop. It also comes bundled with some popular software, including many Abode products. For those who have already purchased McAfee, or who may be considering purchasing the AV software, a McAfee Total Security subscription lets you install the antivirus on your computer and the mobile version on your Android device. You can learn more about McAfee Antivirus in our detailed review. Through its Internet Security and Total Protection options, Kaspersky provides coverage for all of your devices, including Android OS devices and even Mac computers. As a company, Kaspersky is increasingly known not just for its AV tools but for its scholarship and research into internet security concerns, making it a trustworthy source for both researchers and consumers. Our complete review goes into great detail regarding what Kaspersky’s all-in-one tool has to offer. For any Android app, a larger number of downloads usually means the app not only works but has effectively been marketed by both advertisements and word of mouth. Some other factors could result in a large user base for a subpar app, as some more unscrupulous developers will pay users to download the software and use paid reviews, so the other criteria do matter. User ratings (out of 5) are extremely important, but more so when we take a look at how many people have actually left star ratings and written reviews. If an app has a 4.5-star rating, for example, and over 100 million downloads, yet very few written reviews and scores, it could be an indication of fraudulent score purchasing from the app developer. The opposite is also true (low score, but a large number of positive reviews). File size is going to be important for any mobile device as well. While added features beyond just antivirus scanning and monitoring are beneficial, feature bloat can make the app generally unsavory, especially if you already have limited space on your Android device. And while an app might be highly rated and have a lot of downloads, it might also be one that many people aren’t currently using. Recent updates are important, not only to ensure the app is functional but also that it’s still safe to use. Additionally, we look at where the app developer is located. While we don’t discriminate based on location specifically, malware and spyware-loaded apps are more likely to originate from countries where user privacy rules are not strictly enforced. As many antivirus tools may collect and transfer personal data in the process of monitoring your phone for threats, it’s keenly important to trust that your data privacy will be protected. In fact, a 2014 report from AV-Comparatives took a look at AV tool security concerns, suggesting consumers should “install only products from reputable manufacturers, and check that the license agreement does not permit any questionable practices such as allowing any and all user data to be collected.” The report warns against using free products, as they are more likely to misuse user data. To that end, apps from countries with strong data protection laws were scored better in our review. Nothing is ever truly free, so free apps will always come with a risk. For antivirus Android apps, that risk is usually having to put up with a lot of ads, limited functionality until you upgrade to the premium service, or, in some cases, the skimming and selling of user data. We’ve given these apps our stamp of approval after installing, testing, and rating each one. However, they all have some limitations to them as free apps, and we’ve noted any major concerns where necessary. Before looking at the other free options, we need to identify first and foremost the fact that your Android device already has an antivirus tool installed as part of the Google Play Store application. Known as Google Play Protect, Google’s built-in AV tool is already regularly scanning installed apps, as well as any app you might try to install from the Google Play Store. 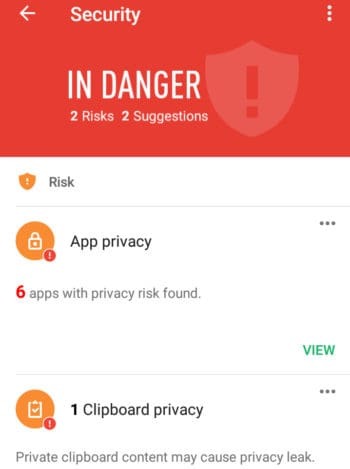 If a threat is located in the Play Store or in an app you already have installed, Google Play Protect will notify you and help deal with the situation. 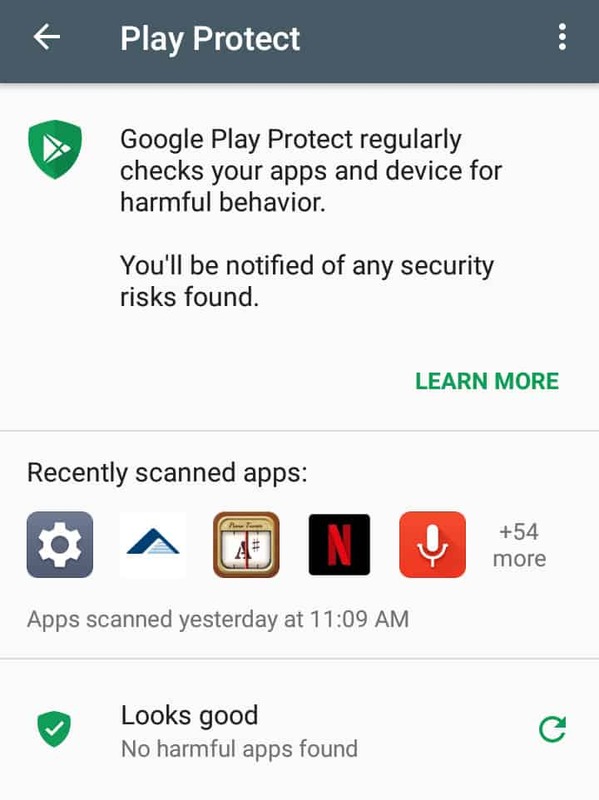 Google Play Protect is designed to both remove harmful apps and protect the apps you have installed. It will also let you know if an app on the Play Store is potentially dangerous. But it won’t remove other types of potentially harmful files that might exist outside of apps, and it may not be able to deal with a wide swath of other malware that can be installed on an Android device. 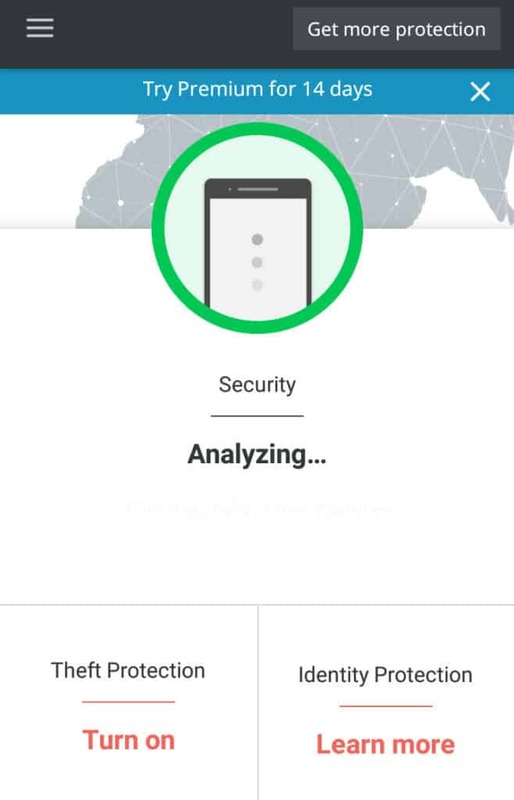 You can check your Android app security status by opening up Google Play Store, then clicking on the menu button (three lines on the top left of the screen). From there, click on Play Protect. You can then see your app and device security status, and run a scan in case you feel like checking. Given the existence of Google Play Protect (a relatively unknown feature), many of your security concerns are already being handled by your Android operating system without any additional software needed. And it’s completely free. However, extra protection may be needed to protect your device, so it’s worth exploring additional free and paid options given Play Protect’s limitations. There’s a pretty good chance you’ve heard of Lookout Security & Antivirus. As a regular Android user, I’ve even had this one come pre-installed on various Android phones. 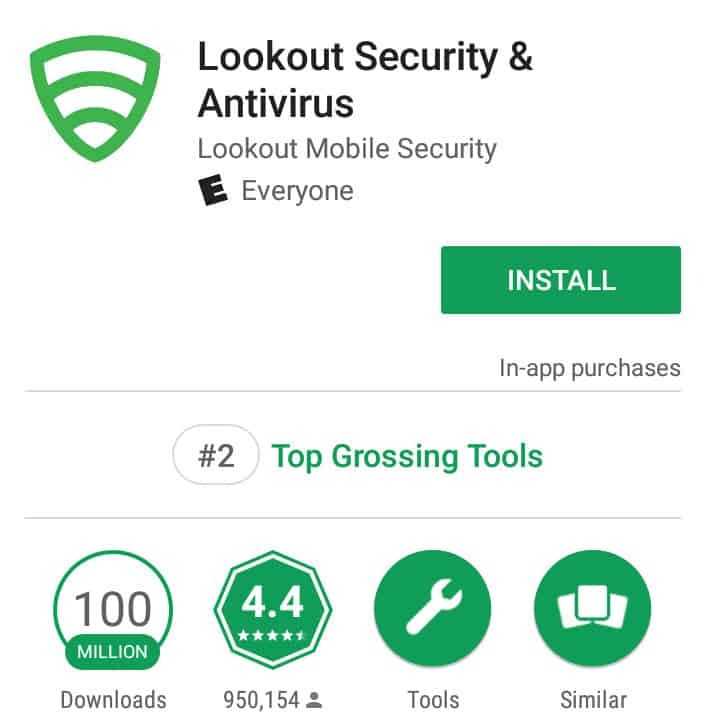 Lookout Security & Antivirus is one of the most trusted Android AV tools available in the Google Play Store, and yes, it is available for low, low price of free. However, the free version is fairly limited, and while Lookout doesn’t monetize the free version with ads, it does offer a feature-expanded paid version that is, quite frankly, just a bit on the pricey side. One thing is certain, Lookout Security & Antivirus definitely looks good. And with the added benefit of having no ads eating up your interface, it’s a much more pleasurable experience. For free, you’ll get App Security, Locate Tools (in case you lose your Android device or it gets stolen), and System Advisor. Each of these adequately provides the protection your Android device needs to be safe from intruders—and thieves. If you want some added theft protection, such as automatic locks when your SIM is removed, or if there are multiple failed passcode attempts, you’ll need to pay for a Premium subscription. For your basic needs, Lookout provides security features that scan for malware and even protects against adware, app droppers, bots, chargeware (apps that charge your digital wallets without your knowledge), click fraud, exploits, riskware, root access, root enablers, spam, spyware, surveillance-ware, toll fraud, trojans, and other vulnerabilities. That’s a pretty extensive list of protections for free. If you want to expand your features, you’ll need a paid account. Premium starts at $2.99 per month, but if you want identity monitoring, social media monitoring, 24/7 restoration assistance, and $1 million identity theft insurance protection (yes, they’re seriously selling ID theft insurance), you’ll need to pay $9.99 per month, or $99 per year (discount applied). Lookout really is a solid app for free. The lack of ads makes it among the best options, so if you already have it pre-installed on your Android, you might as well stick with it. Otherwise, you may want to consider making it your go-to option. Rising high on our list for a large number of reasons, Antivirus Free – Virus Cleaner is a fairly good and thankfully small application with a lot to offer those who want a free AV tool. This is an excellent choice for anyone who is tight on space and doesn’t need an AV tool with a lot of extra fluff. As you can see from the screenshots below, Antivirus Free – Virus Cleaner has a very well-thought-out user interface. And while it is indeed ad-supported, we found that the ads are unobtrusive most of the time. They do pop up after you do most any action, but you can exit out of them fairly easily. While it primarily serves as a scanner and real-time monitor, a neat feature for this tool is its Anti-Eavesdropping function. Through this option, you can keep your private data away from eavesdropping apps and identify potential spam callers. Additionally, you can perform a deep scan with this tool. While the app itself is somewhat small, it appears you can download additional features such as Cool Master, WiFi Doctor, Call Blocker and Green Battery as separate apps. These additional features are fairly self-explanatory, serving to help you better manage your phone. Oddly, Antivirus Free – Virus Cleaner includes a weather notification app. You’re likely already using one, so you can turn this feature off in the settings. Additionally, some of the app’s features can get in the way just a bit, but you can turn off all of the additional features in the settings. The only thing left to contend with is the ads. Overall, Antivirus Free – Virus Cleaner gets high marks from us. If you can stand the somewhat annoying ads, it’s a solidly built app. Although it got marked down for being located in one of the more security-suspect countries (China), CM Security Lite – Antivirus actually has a lot to offer those willing to set that concern aside. Specifically, this app was the absolute smallest Android AV tool we looked into at a mere 1.14 MB. For those with very limited phone space, this is likely going to one of the best no-frills Android antivirus tools to consider. If you’ve reviewed the above info, you might also have noticed that CM Security Lite – Antivirus is not only small but also is ad-free and does not offer a premium service. 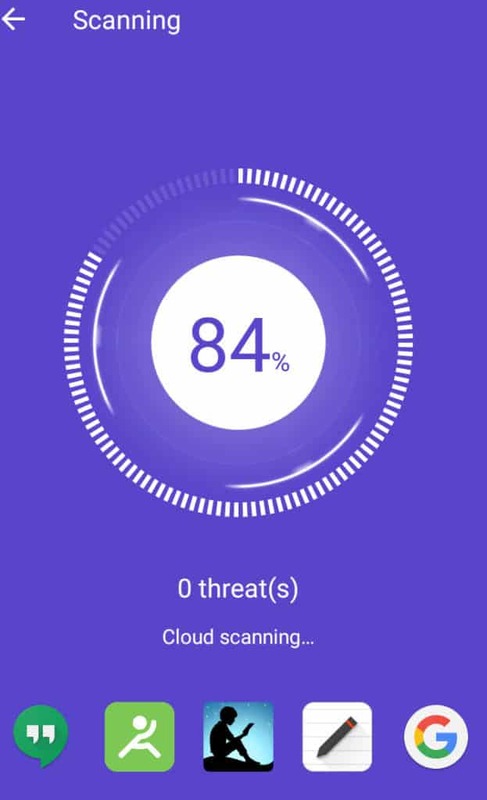 That’s part of what helped it land so high on our list, and it is, in fact, the only antivirus app for Android that we looked into that fits those very narrow criteria. The “ad-free” claim makes it a bit of a unicorn in that sense, but the story is more nuanced than that. The app’s developer gets by claiming “no ads” because there are no ads to outside services. Instead, the app advertises some additional features you might want to try that are basically a plug for a few other apps that the company offers, most notably one called Security Master – Antivirus, VPN, AppLock, Booster. That app is ad-supported and has a paid premium option. So while the two apps are indeed separate entities from the same company, there is a little bit of feed from one into the other. Still, for our purposes, CM Security Life – Antivirus works as its own ad-free, no-payment-needed antivirus tool, particularly given the “ads” are fairly out-of-the-way from what we tested. Because of its small size, what this app does is simple: malware scans and real-time system protection. That small-scale functionality makes it good for those who don’t need a lot of extra features. That said, there are a few concerns with Cheetah Mobile, the developer behind this app, due to some shady activities with some of the other apps they publish. Soon after purchasing an app called QuickPic, the company started loading user data onto their servers. The company has been called out by Android Police for some of their shady practices with other apps as well. More specifically, they’ve been accused of making low-quality apps that just load adware into users’ devices. Again, this is an app from a Chinese developer, meaning it got a bit of the side-eye during our review process and a mark-down on its overall score because of lower privacy standards for user data in its home country. With that in mind, take CM Security Lite – Antivirus with a grain of salt. It’s a fairly good app, and not loaded with the type of adware typically associated with the developer. But when the developer has a bad reputation for that kind of activity, you should know what you’re getting into. ESET is one of the few well-known antivirus makers whose free app made our list. The app comes in with a good amount of support from users and very high customer ratings. Coming from a well-regarded developer like ESET, this antivirus addon suffers only from the fact that it teases a load of nice features for 30 days. During that time, ESET lets you try the premium version of their app, after which you’ll be locked out of everything but the essential AV tools. Still, ESET has quality AV tools for Android users, so it’s not all bad. 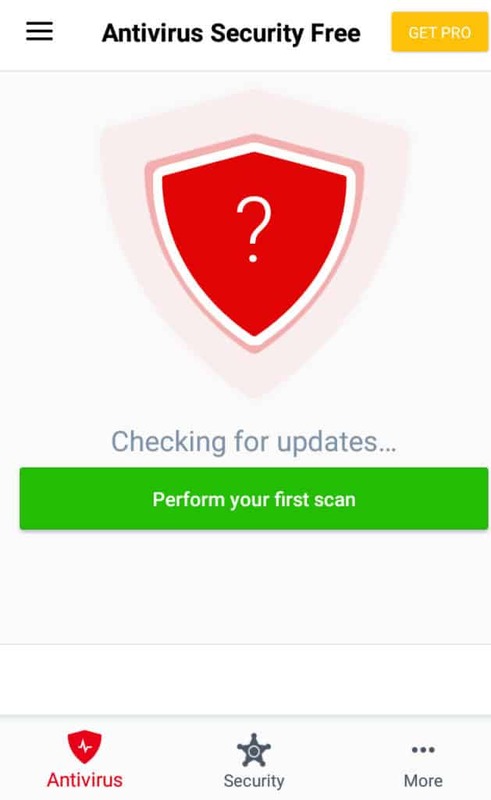 With the trial of the premium version, you’ll get antivirus scanning and a real-time monitor, an anti-theft tool that uses the device’s GPS, anti-phishing, app lock, SMS and call filtering, and a security audit feature. During the trial period, you’ll need to content yourself with ESET constantly pushing a 70% off deal for the premium service and likely more ads for premium after that. But overall the app is still technically ad-free and with a notably attractive user interface. 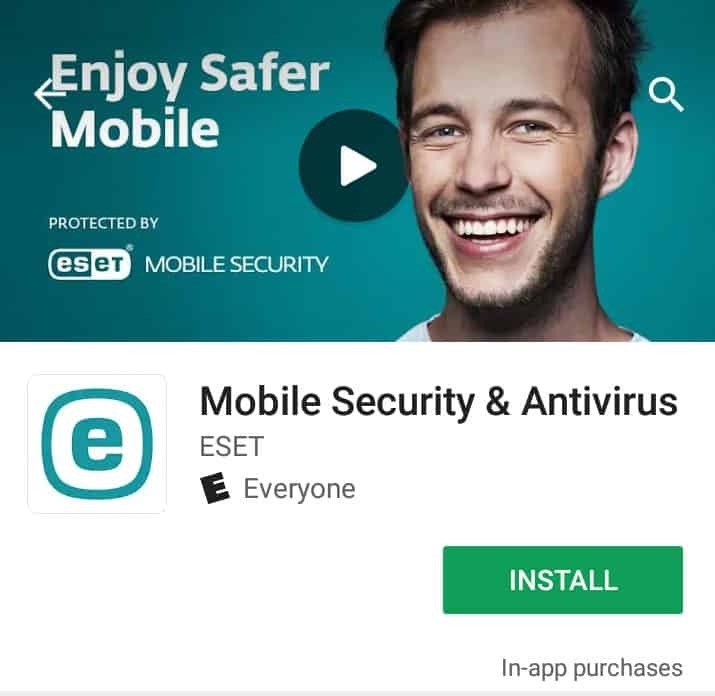 Mobile Security & Antivirus from ESET is a very good option for those who want Android AV protection for free and from as reputable a source as possible. 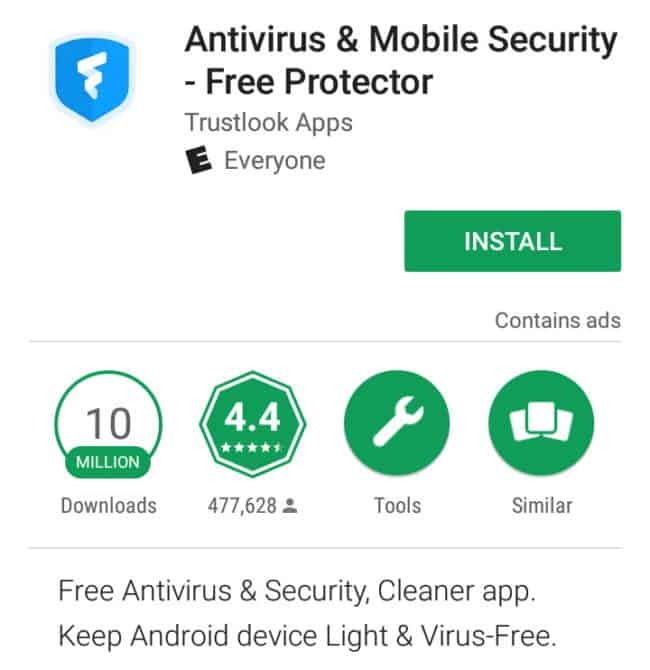 Trustlook’s Antivirus & Mobile Security – Free Protector is a surprising contender in the Android antivirus market. For starters, the company is among the handful of more trustworthy services offering AV tools on the Google Play Store. 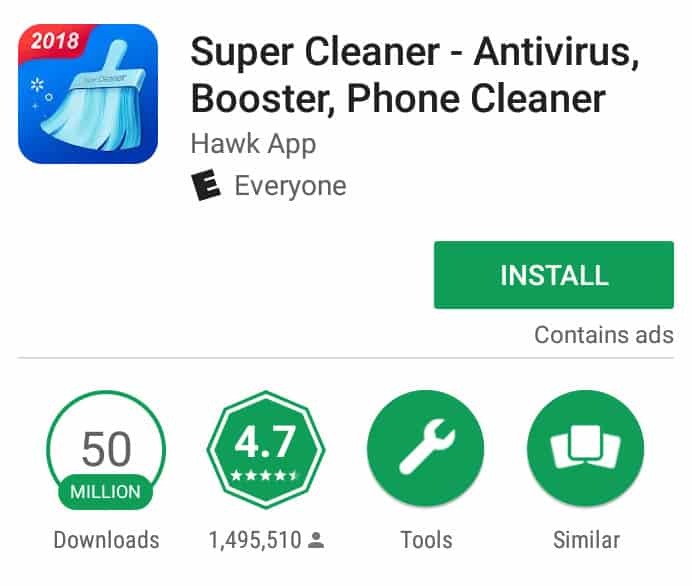 Not only does their app have good ratings and reviews, the company’s Android antivirus tool has received a stamp of approval from AV-Test in the past. Unfortunately, AV-Test has not provided any feedback on Antivirus & Mobile Security – Free Protector since 2015. Oddly, Trustlook’s app shares a suspiciously similar look and feel to Cheetah Mobile’s CM Security Lite. Beyond that, the functions and features appear to work well. The app is true to its word in being a “free protector”. There’s no pay-for-features option, and you don’t get locked out of features after a trial period as you do with paid apps like ESET. Beyond the antivirus cleaner, you’ll find a few additional features, although none that are particularly uncommon. A “Phone Booster” option helps your phone run faster by freeing up some RAM and saving battery life. 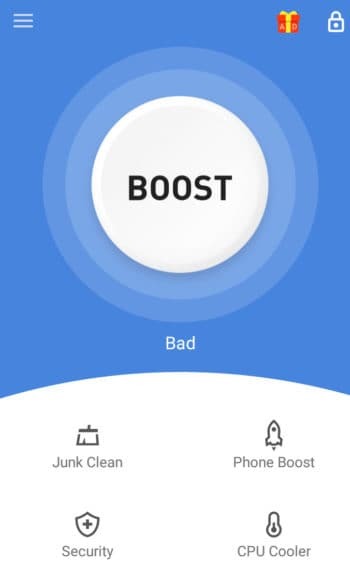 The Phone Booster works the same as most of these type of apps do: turns off certain battery-draining apps, cleans out “junk”, and impacts power consumption by forcing standby modes and times, among other things. 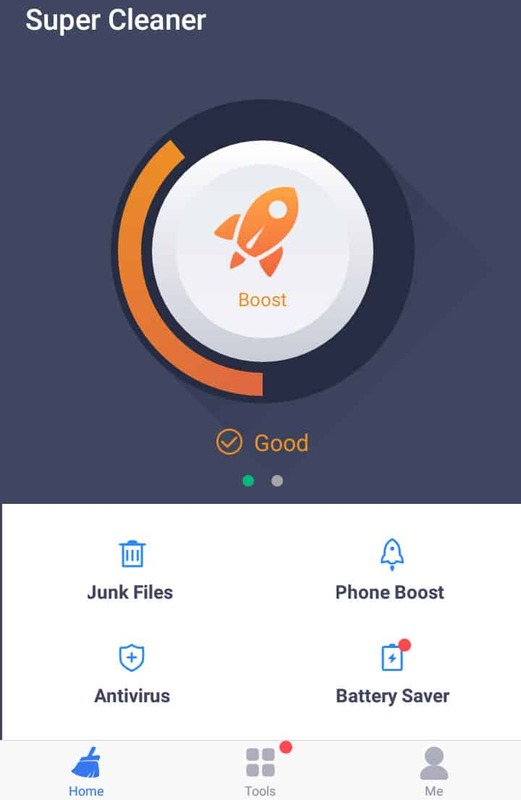 The Junk Cleaner helps you get rid of junk files from your device. The app manager is mostly unnecessary as it doesn’t provide any function not already present in Android. And an app lock feature lets you password protect certain apps that might have a privacy risk. Thanks to the smooth interface, generally good user feedback and very limited impact from ads, Antivirus & Mobile Security – Free Protector is definitely a free AV tool to check out. 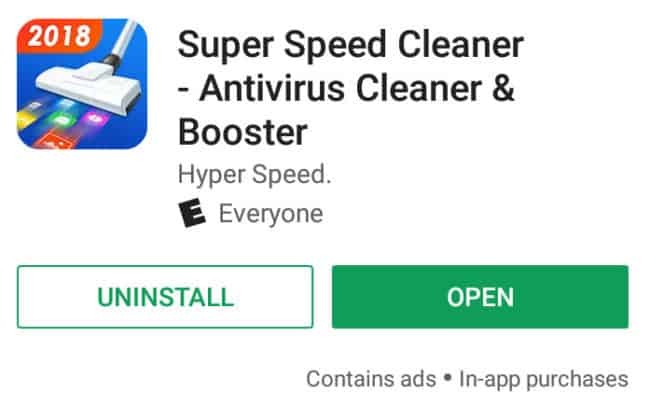 Super Speed Cleaner has all of the looks of a somewhat questionable app, both from the name and from the rather low-quality feature image on the Play Store. However, a fairly effective app behind it all raised this AV tool in the ranks. It has over 10 million downloads, a user score approaching perfect, and comes from an app developer in a country considered more trustworthy with user data (Hong Kong). This is one that you might consider in the same family as CM Antivirus Lite and Trustlook’s Free Protector. 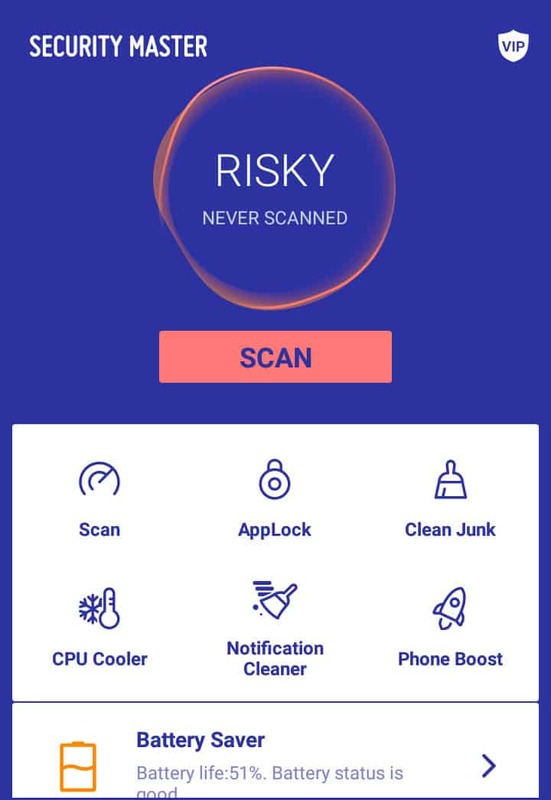 The app has a similar set of features (junk clean, phone boost, battery/phone cooling, antivirus scanning tool and real-time protection). The manner in which Super Speed Cleaner displays its advertisements is very similar as well, with a small bouncing advertisement box in the top right corner. Super Speed Cleaner has more features available than many of its competitors. Call Assistance automatically block calls, enables call back, and automates message replies. A “Game Booster” feature frees up RAM in other places while you’re playing games. What we don’t like about this app is that it installs a separate “One-Tap Boost” app alongside the regular app. While everything else appears to work well, and the ads are mostly out of the way, adding additional apps to your device without your permission is never desirable. 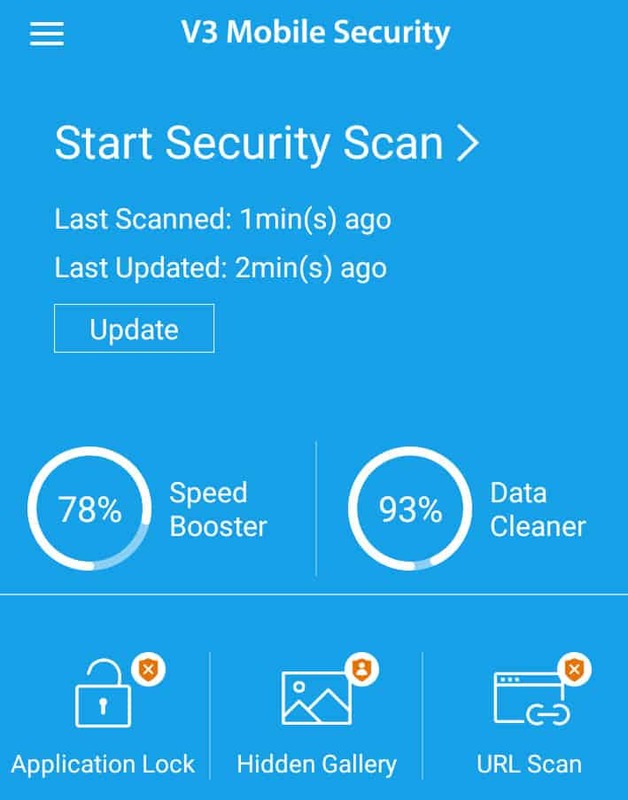 Super Cleaner – Antivirus, Booster, Phone Cleaner appears to be in the same family of apps as CM Lite, Super Speed Cleaner, and many others. Still, this app has some distinguishing features about it that you might want to consider. Most importantly, however, is the fact that it passes many of our smell tests that helped it move up the list into the top 10. Super Cleaner is an antivirus app, yes, but it’s quite a bit more than that as well. The proof is in the name as well as the lineup of features. 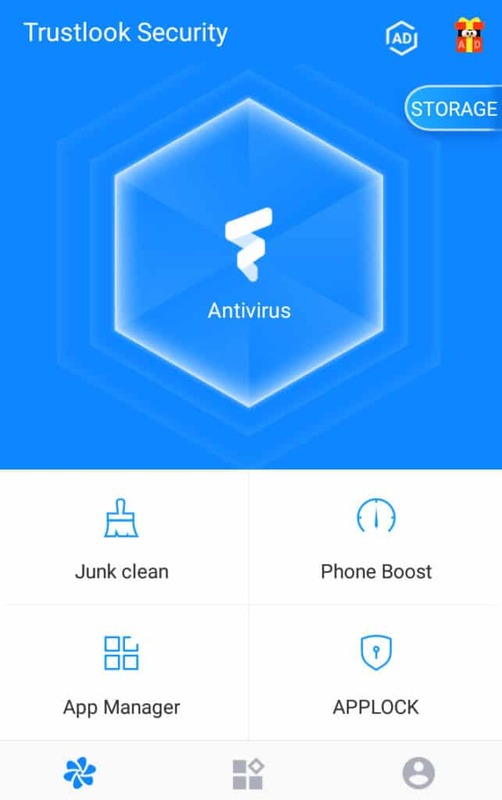 The app gets you standard antivirus removal, as well as all of the following: Junk Cleaner, Cache Cleaner, Phone Booster, Game Booster, CPU Cooler, App Lock, and App Manager. What’s more, the developer Hawk App promises an interesting new feature in the future: Facebook Junk Cleaner. Facebook tends to use up a significant amount of space on a mobile device, making a junk cleaner specifically for Facebook an attractive feature to have. Hawk App’s antivirus tool makes our list, but it’s nothing special. Everything the app offers is fairly run-of-the-mill. The tools all work, but there’s nothing here you won’t find using any of the other AV tools. Still, with 50 million downloads and a large number of positive ratings, it’s a safe bet, even if the app is a bit bloated. Virus Cleaner – Antivirus, Booster from MAX Security offers a rather immaculate interface in a mostly ad-free environment. Although you can shell out some money to make this app ad-free, you won’t really need to. We didn’t find the ads to be obtrusive at all during testing. 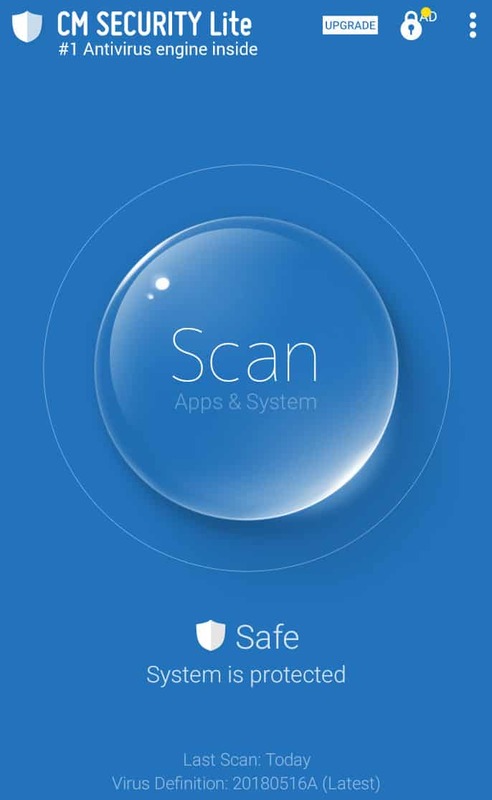 Beyond that, the app works fast to accomplish the various scans and protections it has in place, all backed by the standard antivirus and real-time monitoring tool. You get a crazy number of free features with the MAX Security product. Alongside the virus scanning and real-time protection, MAX Security includes: App Locker, Wi-Fi Boost, Wi-Fi Speed Test, Safe Browsing, Notification Organizer, Private Message (messaging protector), App Manager, Call Assistant (good for blocking calls and numbers), Battery Saver, File Scanner, Game Booster, Data Monitor, and Data Thieves (checks which apps are using data while the screen is locked). Yes, that’s a lot of features. Somehow, MAX Security manages to cram all of them into an app that’s under 7 MB in size. This is accomplished by having a very minimalistic design, but also by not having all of the features installed at first. For example, when I tried to run the booster, I found the app installed a separate “One-Tap Booster” app onto my phone without my permission. That aside, perhaps among the best features with this app is the developer’s willingness to answer negative feedback in a positive way on its Google Play Store page. That’s something we always like to see, and it’s indeed a hallmark of a good developer. 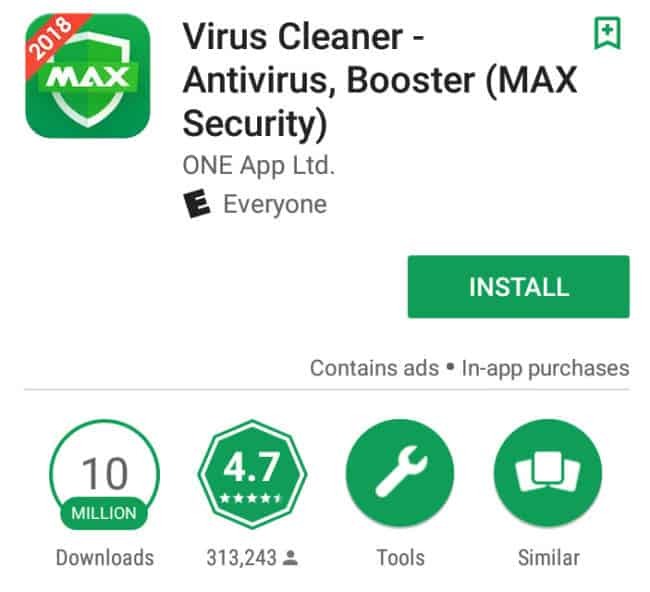 Note: MAX Security from ONE App Ltd has a few clones of their app on the Google Play Store, including Virus Cleaner 2018 – Antivirus Boost, Super Antivirus Cleaner & Booster – MAX, and MAX Cleaner – Phone Cleaner & Antivirus. There is little to no difference between these apps, so use whichever you feel suits you most. ONE App LTD is likely spamming the Play Store with clones of the same app using slightly different app names to increase its own market share and capture different search terms. Ah, Avast. We were happy to see this AV tool rise into the top 10 and make our list of the best antivirus apps for Android. Avast produces a highly desirable and highly functional set of antivirus tools for desktop applications. 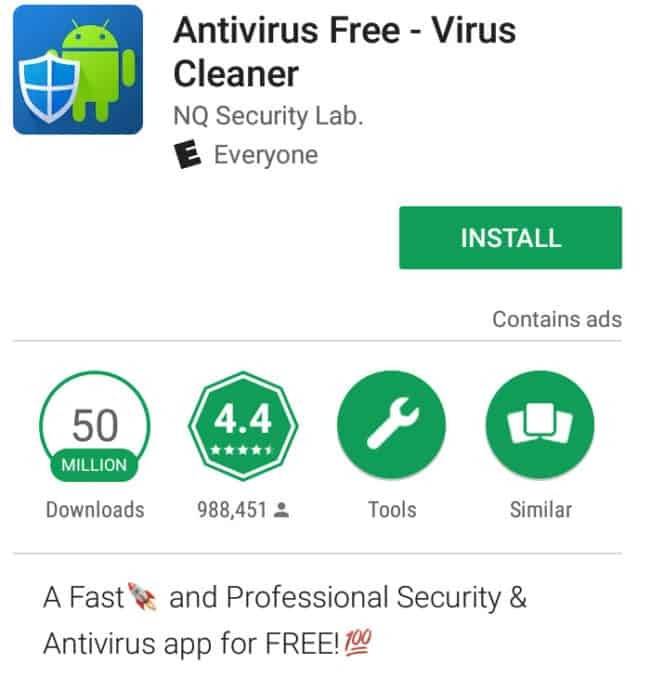 Their free antivirus is just as good as you might imagine it to be as well, especially with over 100 million downloads. While many of the more well-known AV developers offer free versions without ads, Avast decided to include ads on its product. This is not too much of a problem. 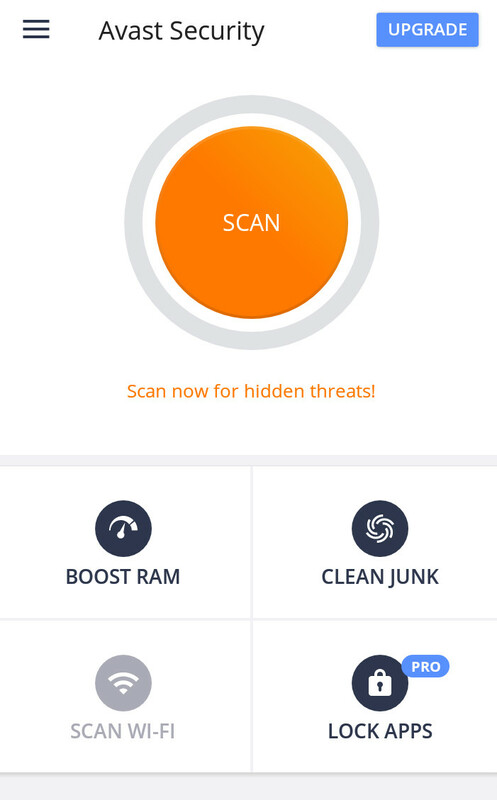 Avast avoided pop-ups, and instead, ads appear on part of the screen while performing or using different features, such as when running a virus scan. The user interface is well constructed, although it still looks similar in many ways to most of the AV tools on the free apps list. Avast pushes the Pro, paid version upgrade rather noticeably, but doesn’t do so with too much intrusive gusto. It mostly advertises the paid version next to the features you’ll need Pro to unlock (remove ads, app locking). For free, you’ll get the AV tools, Anti-theft, Photo Vault, Wi-Fi Security, and a Wi-Fi Speed Tester. Avast has a 14-day free trial that removes the Anti-theft and Photo Vault features after the trial is up. This puts Avast lower on the list for extra features, but it’s still a quality program for what you’re paying (nothing). 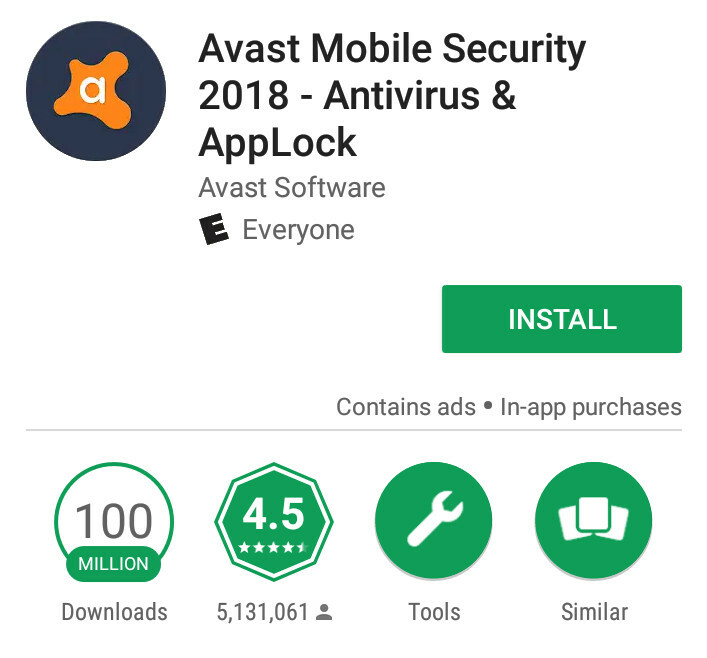 And while it’s a bit unusual that you need to pay to get a feature many other competitors are giving for free (namely, App Locker), you’re at least backed by the comfort of knowing Avast is a well-vetted developer. 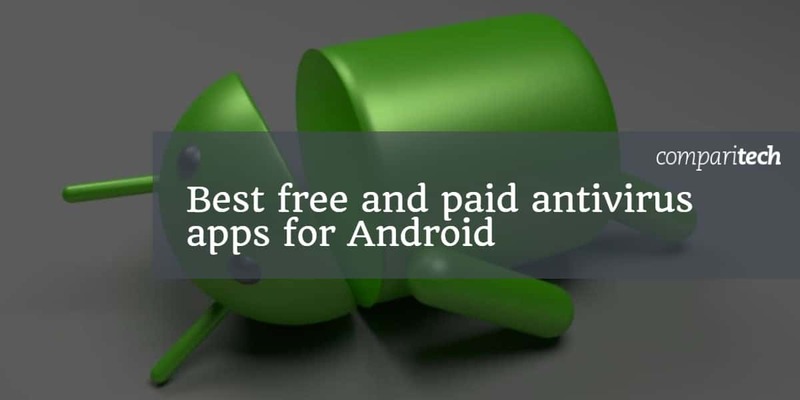 As with the free antivirus apps, the paid Android apps can be ranked on their features, version update status, ratings, number of downloads, reviews, and data protection trustworthiness. For paid apps, we added in two new criteria: cost and payment method (subscription-based, one-time payment, or both). Quite obviously, the higher the quality and the lower the cost, the better. Additionally, we relaxed some of our criteria in order to have a wider pool to work from. As there are fewer trustworthy paid AV apps for Android, we allowed for apps that have fewer than 1 million downloads to make the list. Ultimately, many of the free apps with paid versions ended up on our list of the best paid antivirus apps, although you will need to determine for yourself whether there’s any benefit to paying. After all, many of the paid apps only offer to remove ads for a fee, while others include an expanded list of features that you pay to unlock. As most of these tools are already on our free list, your primary concerns will be whether or not the app is worth the price of an ad-free upgrade. However, a select few of these apps are new to our lists and received a more detailed mini-review similar to what you’ll find in the free apps section. As covered above, much of what you get with Avast Antivirus 2018 is already included with the ad-supported free version. If you choose to upgrade, you’ll get the App Locker, Anti-theft, Photo Vault, and an ad-free experience. Thankfully, Avast avoids any confusing payment methods. You’ll pay annually for the service, and the annual fee is actually rather small. Still, are the ad-free experience and additional features worth the price? That’s for you to decide. Beyond that, Avast provides one of the best paid AV tools you’re going to find on the Google Play Store. Hyper Speed’s Super Speed Cleaner is packed full of features. You can get all of them (antivirus, app locker, game booster, et. al) without ads if you pay a small fee. Given this app is high on our list for quality free AV tools, it easily made it here as well. However, you’ll only want to pay if you both love this app and really hate ads. Otherwise, it’s not worth paying the somewhat high price just to take ads away, especially because the payment is subscription-based and not a one-time fee. 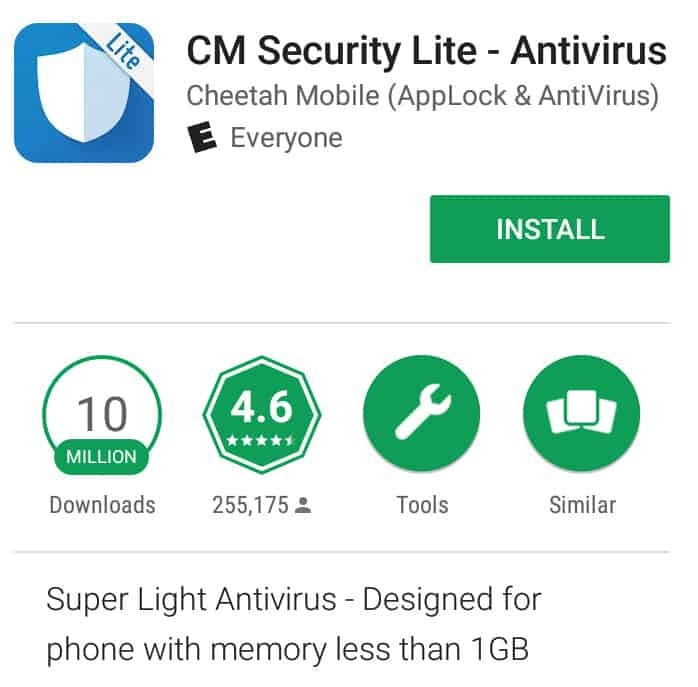 You’ll find that Security Master – Antivirus, VPN, AppLock, Booster is another Cheetah Mobile application (like CM Lite), but is both ad-supported and with a paid app. It didn’t make the list for best free AV apps, but it does make the list of paid ones. On a fundamental level, Security Master is very similar to CM Lite, only with a wider expansion of tools and features. Security Master also got a stamp of approval from AV-Test for protection, although AV-Test did knock it low for usability. According to AV-Test, the app gives a large number of false warnings. Without paying for this app, you’ll get antivirus scanning and real-time protection, AppLock, junk file cleaning, CPU Cooler, Notification Cleaner, Phone Boost, Battery Saver, Game Boost, Message Security, Wi-Fi Security, Safe Browsing, and limited access to SafeConnect VPN. That’s quite a lot for free, and it might be a good option alone as a free version. Paying for VIP status gets you an ad-free experience, Scheduled Boost, and 200 MB of VPN usage. The “Premium” purchase, however, throws in unlimited VPN. Cheetah Mobile’s pricing schemes are somewhat complicated, and there are some concerns over the VPN from this company, especially given its less-than-stellar history with user data usage. 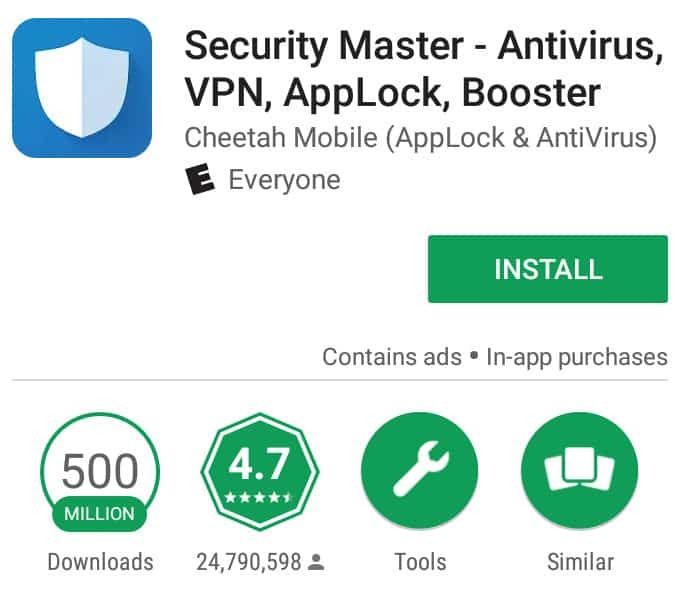 At those prices, Cheetah Mobile’s Security Master is among the most expensive AV tools for Android. Whether or not it’s worth that price to you depends on whether you really need the scheduled boosting, unlimited VPN, and no ads. If you’re in it for the VPN, however—don’t. There are better, more trustworthy VPN options out there. If you truly need a VPN alongside your AV tool, just use the free version of Security Master and download and install a higher-quality, trustworthy VPN, such as ExpressVPN or NordVPN. Both have apps for Android devices. 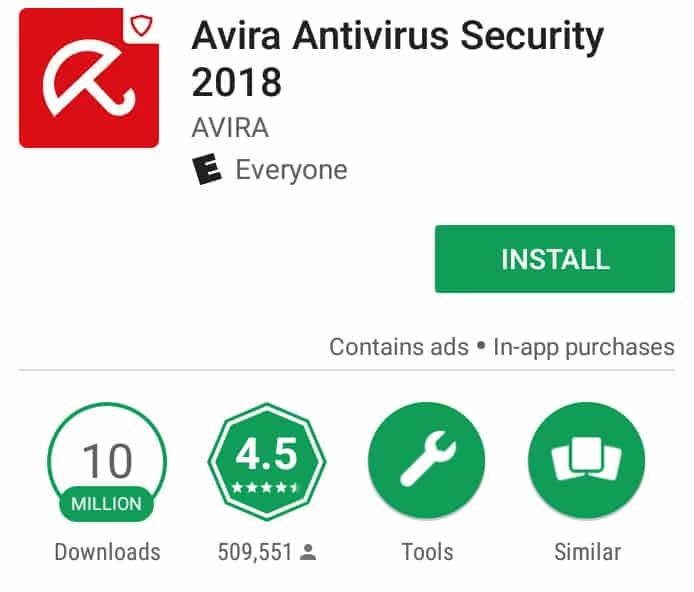 Although it did not make it to our list of free AV products, Avira Antivirus Security 2018 does indeed offer users the option to use their Android app for free. And with the quality and experience that Avira brings to the table, there’s a good chance you may choose this one as your go-to free option even though it’s not in the top 10. Why was Avira not in the top 10? Mostly because other apps had more downloads, slightly better user ratings, smaller file sizes, and were updated slightly more recently during our test. That said, it would easily have made it onto a top 20 list. For free, Avira offers a heavily ad-supported app that provides a scanning tool, real-time protection, and a few useful features. Those include Anti-Theft, Identity Safeguard (lets you search a public listing of data breaches for your email address), Call Blocker, and a Piracy Advisor that lets you know which apps on your device have limited security. If you pay to upgrade to Avira, the company throws in Camera Protection to prevent camera hacking, Microphone Protection to prevent audio hacking, and Web Protection to safeguard your device while browsing the web. Avira also removes the ads, regularly updates their antivirus database, and provides tech support to paying customers. The price makes Avira among the cheaper options available. You’ll pay $11.99 per year for the service and its added features, or just $0.99 per month. 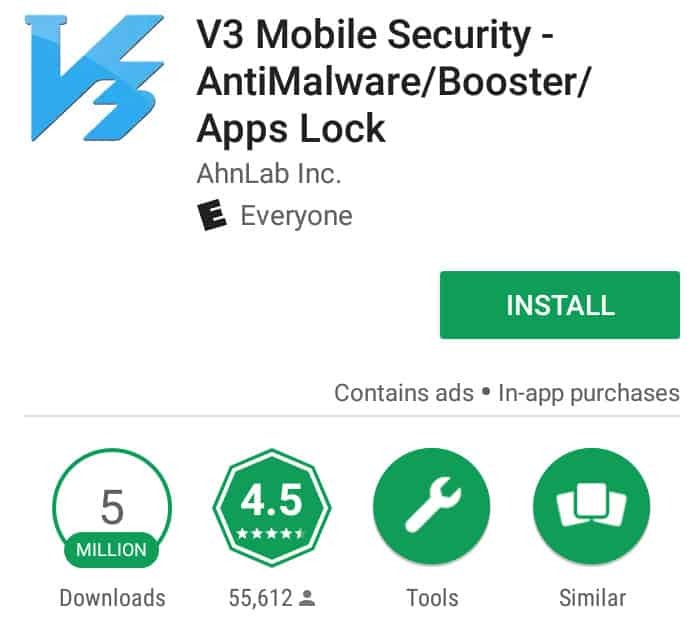 With 5 million downloads, a 4.5 out of 5 score and an AV-Test stamp of approval on its side, Ahn Labs has a lot to be proud of with their V3 Mobile Security app. 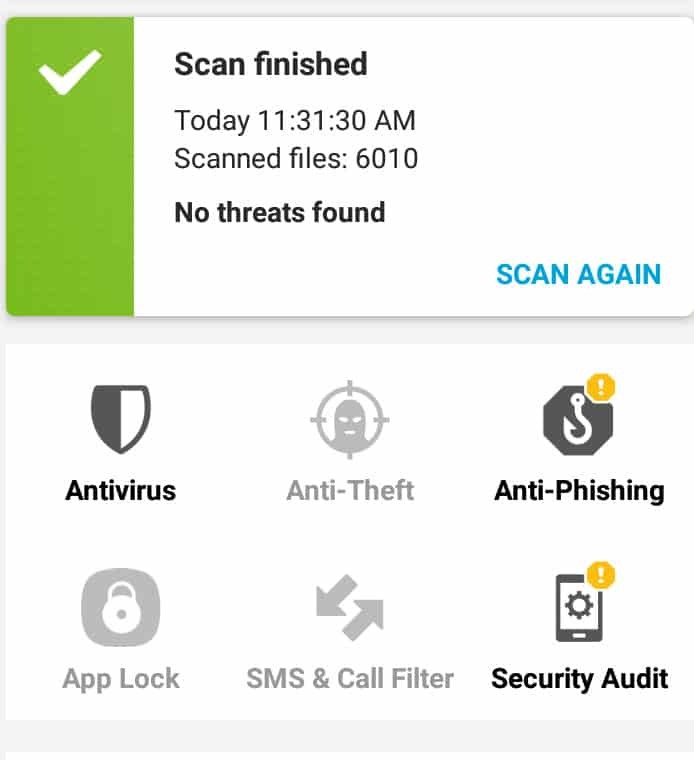 As with several other options on our paid apps list, V3 Mobile Security offers a free version that did not make it on our top 10 free antivirus apps, but its paid version hit the right marks to finish off our top 5 list. One of the best things about this app is the fact that it tells you everything it needs to access on your device before you install it. With the recent move toward more transparency in how services are using your data, AhnLab was already ahead of the game. And indeed, many similar apps get these permissions without asking for them up front or as obviously. That said, V3 Mobile Security does require quite a lot of access. You’ll need to agree to give it permissions for device administrator, device and app history, contacts, SMS, phone, camera, location, device ID and call information, fingerprint sensor (if you have one), draw over other apps (screen overlay), notifications access, in-app purchases, and account info. That’s 13 permissions you need to grant it, to what is effectively every important section of your phone’s operating system. Immediately after downloading, you can perform a malware scan. The app will help prevent smishing, adds privacy protections for apps and files, and has a memory optimizer. Outside of that, V3 Mobile Security includes a URL scanner to test for suspicious links, QR code scanner, Privacy Advisor (checks what permissions each app on your device), Privacy Cleaner, Hidden Gallery (for secret photos), Call Block, Booster (to restore some processing power by deleting unwanted processes), Application Lock, Do Not Disturb (silences calls, notifications, alarms on a schedule), and a weekly report for activity. So what will you pay for these features? Nothing. AhnLab offers all of this for free. However, the app is ad-supported, so the paid options are solely to get rid of the ads. Is the cost worth it? Maybe not. This is one of the best paid apps, but you might not even need to pay for it. The ads are almost nonexistent, to begin with, while the app offers a quality experience for free. Do I really need an Android antivirus? The simple answer here is yes. But it’s a bit more complicated than that. Although Android devices are far more prone to getting viruses than iOS devices, the two operating systems are built similarly. The way both Android and iOS work makes it more difficult for a virus to actually do anything to your device once there. Like iOS, Android is based on the Linux kernel and uses a processes known as sandboxing to help protect your system’s security. With sandboxing, each application is assigned its own spot in your device’s hard drive, and cannot interact with other applications without the requisite permissions given to it. In fact, every app you install needs to ask permission to do pretty much anything. This is why you’ll find that after installing an app on Android, it might ask permission to access other parts of your phone, such as the camera or contacts list. Sandboxing makes Android inherently safer than Windows, for example, but does not free the operating system from viruses or hacking. As with Windows, hackers tend to favor Android because of how many users there are, so hackers tend to work diligently to find ways around the security measures. As such, there are many viruses out there that can attack an Android device, either by infecting a single app and getting permissions, or by finding ways around the sandboxing method. So while your Android’s basic design will prevent viruses from being effective to a degree, the sheer number of Android users, combined with the security loopholes that exist, make antivirus software for your Android device a real necessity.